We focus on products that create fun learning experiences and offer them at values that help teachers stretch their budget. Oriental Trading Company, the nation's largest direct retailer of value-priced party supplies, arts and crafts, toys and novelties, has launched a new teacher supply store and brand, designed by teachers, focused on making learning fun for less. Learn365 (http://www.learn365.com/) is the source for everything education, providing a wide range of products that help teachers maximize their budget in a dedicated shopping experience for those who develop, teach and inspire children. 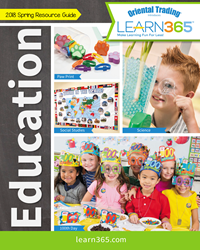 The Learn365 catalog and website deliver budget-friendly solutions to make learning fun every day, showcasing everything from curriculum-support products, everyday education essentials and art supplies to classroom décor, hands-on games and learning activities. Learn365.com also features inspirational ideas, games, activities and shoppable DIY projects that help teachers engage students and foster a love of learning. "We want to be your partner in making a positive difference in children's lives," said Brian Moen, Chief Marketing and Merchandising Officer at Oriental Trading Company. "That's why we focus on products that create fun learning experiences and offer them at values that help teachers stretch their budget. Additionally, we help make shopping across Oriental Trading and Learn365 easy and efficient with one shared checkout." Learn365 offers over 600 hand-picked, name-brand products, including Crayola, Elmer's, Dr. Seuss, Creative Teaching Press and Learning Resources. In addition, their in-house education experts develop exclusive products and classroom supplies that stand the test of time and meet educational standards, making the often-out-of-pocket investment worthwhile. All products are specifically created and chosen with both the teacher and student in mind. "Whether searching for school activities or fun summer projects with the kids, Learn365 is the perfect one-stop shop for teachers, caregivers or parents," said Meredith Hazel, blogger at Wait 'Til Your Father Gets Home. "The site is super organized, and makes shopping a breeze!" Learn365 (http://www.learn365.com) is the one-stop-shop for those who develop, teach and inspire children. From everyday education essentials and curriculum support to classroom decorations, art supplies and hands-on activities, our products help you maximize your budget, engage learners and supply fun. Designed with both the teacher and student in mind, our quality collection means more saving, more learning and, most of all, more fun. An extension of Oriental Trading Company, Learn365 is focused on providing quality products and ideas that make learning fun for less. For more information, call 877-513-0386 or go to learn365.com. Oriental Trading Company (http://www.orientaltrading.com/) is the nation's largest direct retailer of value-priced party supplies, arts and crafts, toys and novelties, and a leading provider of teaching supplies and affordable home décor and giftware. Recognized as one of the Top 100 Online Retailers, Oriental Trading Company employs approximately 1,700 employees and offers more than 40,000 products to individuals, teachers, schools, churches, businesses and nonprofits. From pink flamingos and grass skirts to holiday decorations and craft supplies, Oriental Trading Company makes the world more fun! orientaltrading.com.